This fire is compatible with a Pre-Cast Flue System. Pre-Cast Flue Chimneys are commonly found in more modern homes which have chimney constructed using a 127mm/5" (class 2), hollow concrete flue blocks. The blocks create a flue up through the property and usually have a ridge vent on the roof. This fire is compatible with a Class 2 Pre-Fabricated Flue System with a minimum internal diameter of 5" (127mm) or greater. This fire is a radiant gas fire.The heat moves radiates out away from the fire out into the room, the closer you get to the fire the warmer you will get. This is fire benefits from convected heat. The convector fire incorporates a cleverly designed heat exchanger that provides draws cold air from the room and turns this into warm air. The cold air passes through the heat exchanger and this turns this cold air into warm air which helps heat your room at no extra running cost. Pat. Tatem nit alis niamet wis do core dit eum nos nullupt atinibh ea facidunt in exer ing exercin verit praesse quametummy numsandit am, sum dolenibh ese dolore elit, verit praessisim at praessed tissectet lumsan ullutpat wisl et, se facinis dolore molore dolorperatue faciliquat vulputpat aciduisl estrud euguer alit non vero exer se tionsequisi blan exerosto eu facipisim quipis dolore moloborem quat, conum. 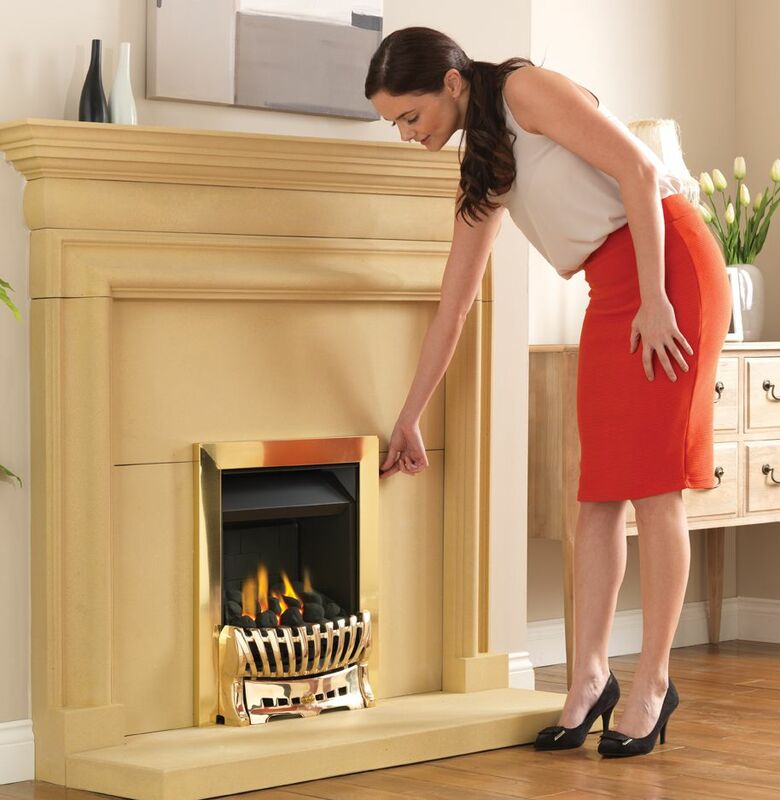 The Asaba is a slimline convector inset gas fire designed for homes with a shallow pre-cast flue, class 1 or class 2 pre-fabricated flue systems (min. 127mm or 5" diameter) or conventional class 1 brick chimney. It features a slimline design with clever heat exchanger that provides convected heat in addition to standard radiant heat. The Asaba's versatile slimline firebox fits a standard 16" (wide) x 22" (high) opening. Thanks to its shallow depth the Asaba only requires a fireplace depth of 125mm plus 20mm debris collection. This makes it a very popular choice where depth and heat output is a priority. The Asaba can be specified with coal or pebble effect fuel bed. It is available as Manual Control (Rotary), Manual (Fingerslide) or Remote Control. The Blenheim fret is a traditional cast design with ornate features. It has a very slightly bowed profile and two decorative finials. The Blenheim fret is available in; brass (solid brass), brass & black (solid brass), chrome (chrome plated brass), chrome & black (lightweight aluminium), black (lightweight aluminium). The ashpan is a separate component and provides access, if applicable, to the controls (model dependent). The one-piece frame is held in position with magnets (supplied) and depending on the model is available in; brass effect, chrome effect or black.